One of the easiest ways to cut bread is also one of the best looking. This sharp looking knife would be an attractive addition to any kitchen. Sleek styling and a colorful coating make it attractive to look at, and high quality materials make it perform better than most. The super sharp blade is made from carbon steel, and then coated in a non-stick material that reduces friction. This combination results in a knife that cuts without effort, and glides through food without sticking. You will get a nice clean cut every time with very little effort. It's designed for use on bread, but it can also be used for tomatoes and other veggies if desired. The included safety sheath is great for storage or for taking it with you on the go. Just slide it into the plastic cover, and toss it in the drawer, or pack it up to bring to a party, campsite, picnic or anywhere else. You never have to worry about open blades, so the possibility of damage or accidents is greatly reduced. 7" serrated blade. Super Sharp. High quality steel from Japan ensures a strong blade that will perform as expected. Coated. For effortless slicing and quick clean-up, the whole blade is covered in a non-stick coating. Protected. It comes complete with a durable sheath that covers the blade for storage. Keep it sharp, and protect rummaging hands. Travel Ready. Take it to a party, bring it camping, or come prepared when you bring a fresh loaf. The storage cover is perfectly protective when on the go. Added Color. The outer coating improves performance, but it also makes it look cool. Select your favorite to blend or stand out as desired. Tired of struggling to get through the crust, or getting annoyed by loaves that squish? Kuhn Rikon's Bread Knife, is the answer. Easily cut slices, and achieve great results with minimal effort. A simple sawing action will power through the thickest crust, and the slippery blade will glide through any type of bread without sticking or forcing you to flatten it for leverage. It features a nonstick coating that allows food to glide easily across the surface and then wash off quickly when your done. The ergonomic handle is easy to hold, and it features a soft comfortable grip. Stop struggling with tools that are too short, or too dull. Get this one and guarantee clean slices of bread, tomatoes and more. Overall Dimensions 11.75" x 1"
Bade Dimensions 7" x .1"
Slice that baguette like a pro. 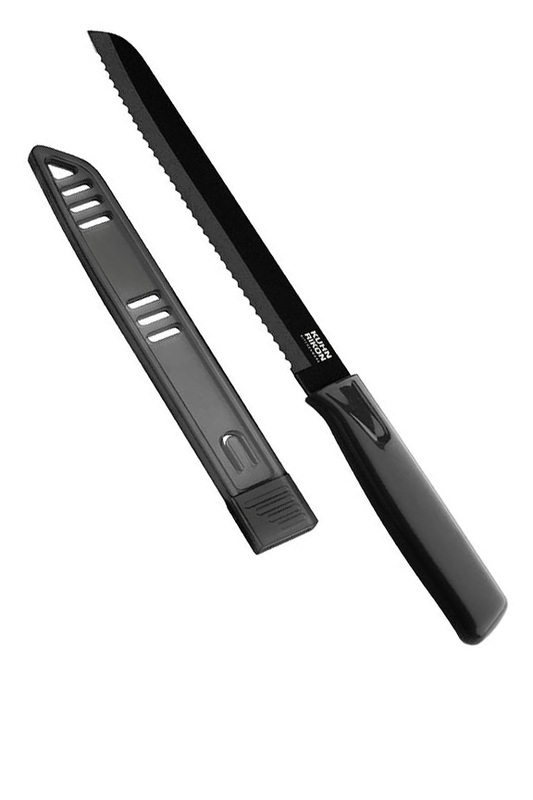 A super sharp blade combines with friction reduction to make slicing fast and easy. A great Bread knife. also good for cutting lettuce when making salads. As it does not turn the ends red. As for bread. it slices newly baked bread right out of the oven with out crushing the rest of the loaf. Works like magic when cutting loaf after loaf. A truly amassing knife. A very beautiful and functional teflon (?) 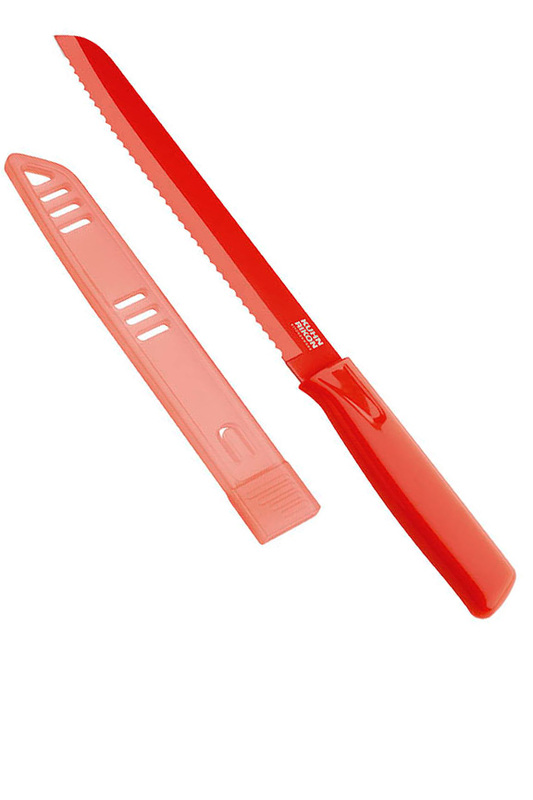 coated bread knife with a neat scabbord.